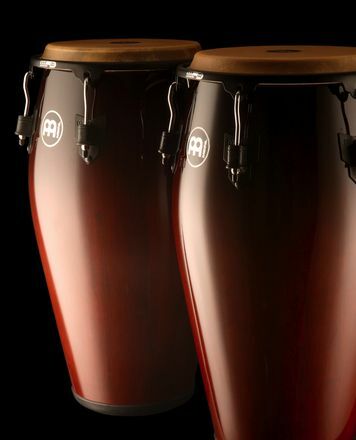 These congas have a fantastic clear tone for their price. Once the stock heads are swapped out for some better ones, the sound becomes perfect for studio work. Nice and dry. -The rubber rings glued to the bottom of the congas for protection will come off very easily, the glue used wasn't that great. I glued them back on using hardware-store wood glue and haven't had another problem since. That's a very minor problem though. -More importantly, the tuning nuts will not stay put and keep their tuning. 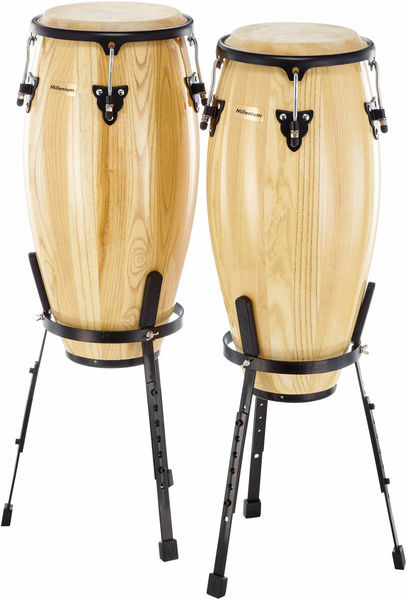 I'm not sure how they're so unreliable, but after any significant time playing or time left alone, these congas will become detuned. This carries on happening even after you break in the new heads. It's simple to tune these things anyway, and who really cares about perfect tuning with congas, but still a bit annoying when you need consistency, especially when I've never before encountered a drum that so readily detunes. Other than that, this is a cracking percussion set for the beginner or intermediate and straightforward to set up and use straight out of the box. I purchased the product for simple home use and to improve. It satisfied this purpose. As I got better, I was able to figure out the nuances of the instrument, and now hunting for a better quality set. Cons ... As a beginner I tended to bump my hands on the metallic circular rim. Now my hands are very big so if you have normal to small hands this wont be an issue. If you have big hands spend a bit more money and get something of higher quality.